LiteManager Pro — remote access software for remote administration of computers over the Internet or remote control in a local network, for distant learning, providing remote support to users and supervising work activity of employees. The freemium model is very flexible, allowing 30 free licenses and is affordable beyond that. It's certainly worth checking out. Litemanager is very feature rich, providing not only remote desktop access but also task manager, command line, registry and more. It has silent install and uninstall for easy distribution to client machines. LM requires a little more setup for unattended, ID based access than teamviewer or logmein. In previous versions remote control was a little slow in my experience, but with the latest version it's reasonable, if you turn off the background picture. Also connecting to a machine seems the slowest part and there was very little indication that something is happening. In the past there was none, but now it has a text status indicator. The software configuration panels aren't pretty, but they are functional. It's free to try out on many computers and it is worth doing so. The connect by ID feature that allows unattended access without knowing IP addresses are what sets it apart from tools like VNC or RDP. Unattended, ID based remote control of client computers. "LiteManager for remote support, administration and classroom management "
LiteManager is very easy and fast. There is a lot of useful features for example remote desktop control, file transfer, task manager, remote execute, registry editor, chat, remote shutdown, telnet, inventory. Additional LiteManager has a special functions a screen record, private ID server for connection by ID in your private network, HelpDesk tickets system, remote installation. Screen demonstration a special mode for education management in classroom and schools. LiteManager supported all Windows version and can work in Linux and Mac OS (runs by Wine emulator well). LiteManager has absolutely Free version for 30 PC for Home and business use. Pro version cost is very low, there is two license type: standard license based on number of PC cost $10 per computer and HelpDesk license based on Active channels (connections) for unlimited PC cost $300. License is lifetime, only one time fee, all updates is free. LiteManager has free Android client. LiteManager can work in local network use direct connection by IP address. For connection through internet use a connection by ID mode, set your own ID, it is can be a word or numbers. Use QuickSupport mode for work without installation a server side. LiteManager does't have IOS client and native application for Linux and Mac OS. LiteManager has only English language. I have configure corporate remote support system use only own servers with use private ID server. I use LiteManager in a private local network for unattended access to remote PC or Windows server. I use LiteManager Free at home and recommend use it for my friends in business and in education. It's free and support up to 30 PCs, that is so helpful for small classrooms. be honest there is no free class manager software which has such a lots of great functions like LM. Simple interface makes is easily to understand. Maybe my problem but I couldn't auto detect students PCs automatically. I had to add them manually and config each client too, when another Teacher comes to class, he have do the same to add all connection!! I use LiteManager in a private local network for unattended access to remote PC or Windows server and also use it in classroom inside my office to demonstrate Ideas and lectures. "LiteManager has helped me a lot"
Before I got Lite Manager I had to go to each of my individual computers (I have seven all networked together) to make changes, shut down and do many other things. Now, I am able to manage all of my computers from my main computer, the Viewer. I would heartily recommend Lite Manager to anyone looking for the capability to manage several computers. I am not sure I dislike anything. However, I recently had to reimage my main computer and thereafter, reinstall Lite Manager. I am now having a bit of difficulty connecting the computers to the main computer, the Viewer, via the IP. I am sure I am making some simple mistake and am confident I will get it done today. The capability of keeping all of my computers, some of which are used by others, in sync and this is a blessing. "Free remote control with LiteManager"
I like that I can use LiteManager (with Free version) to connect to my personal PC when I'm away from home or not in the office. It's very fast and easy. Cross-platform: Android, Mac and Windows. Installation was quick. Lot of functionals as NoIP connect, videoscreen, chat, etc. Anti-Virus can detect this program as harmful, but it is not so. The process of getting things done on remote computers without physical access is of very great value to me. "Remote Desktop Help Desk Software "
This software allows great connectivity and all the features provided in the viewer is amazing also with that NoIP option makes the software more flexible. The price is less compared to other remote connection software.Support is great they revert back quickly. Until today I personally didn't find any bug but I am looking for the Lite manager development team to add the feature of incoming connection IP filter where we can add public IP of only from which the connection is permitted as a lot of companies look forward to having feature like this. One of the drawbacks of this software is the graphical interface, since it is a somewhat old-fashioned style, reminiscent of the style of Windows 98 windows. This software results in the problems of a computer of type: locks, connectivity, installation ... everything that a basic user is not able to do. The benefits are speed, an administrator can remotely access the equipment and solve the problems that the user has. "Very good remote desktop tool"
I like simple control and view the desktop of a remote computer. It's very fast and easy. That software with text\video chat, screen recorder, connect by ID and more. All good for me, and no problems with this program. I can solve performance problems for any person, being at the office. I help install the program remotely, I can control and learning at a distance. 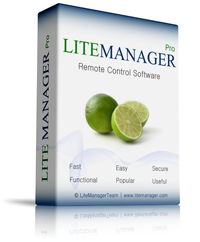 "You can do maximum with Lite manager remote access"
Solving many remote PC problems . Very good downline files and video convertors . "A great inexpensive alternative for remote computer administration." There are a ton of nice features, such as an FTP-like (Total Commander-like) remote file access, remote chat and more. Being able to have control over your own "No IP Server" is also a huge plus. It takes a bit of work to setup, especially your own No IP server, but that is to be expected. I will be using this software to connect to client systems to provide remote support. "the most accessible program for remote support"
The most accessible program for remote support. Easy setup and use.Possibility of inventorying workstations. For such a price, there were no shortcomings in the work of the program. * We monitor all LiteManager reviews to prevent fraudulent reviews and keep review quality high. We do not post reviews by company employees or direct competitors. Validated reviews require the user to submit a screenshot of the product containing their user ID, in order to verify a user is an actual user of the product. Hi there! Are you looking to implement a solution like LiteManager?